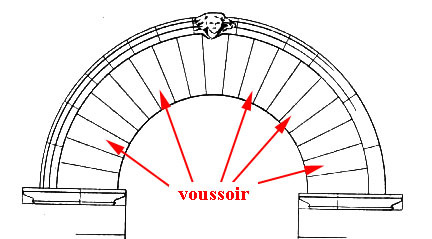 voussoirs: THE ZAHA ABEDIAN SUNLAND TOWERS - GOLD COAST'S BILBAO GUGGENHEIM? Artist’s impression of Sunland’s proposed $600M residential and cultural precinct at Mariner’s Cove. 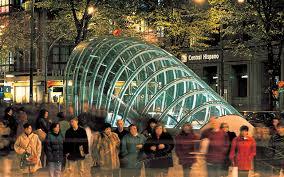 Ever since Bilbao successfully revitalised its identity with the work of Foster, Calatrava and Gehry, every small, insignificant city and town has dreamed of becoming great with just one outrageous, ‘iconic’ building. 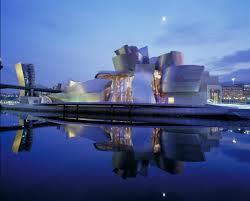 The Guggenheim at Bilbao by Gehry is the reference because it presents the most obvious and extreme difference that attracts. It is the gleaming highlight. Every place now seeks out its ‘Gehry’ in the hope that it too can become the centre of the world, or at least one more ‘must-see’ tourist attraction. 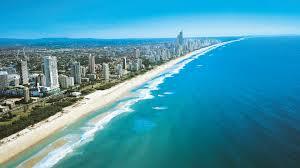 The Gold Coast City is not immune from this dream. It keeps trying with every project that can be envisaged to grab the limelight with something eye-catchingly extreme, for this is how the ‘Bilbao’ success has been rationalised. 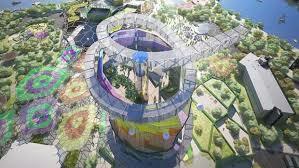 One attempt to achieve this outcome was with the design of a new city cultural centre by ARM – see http://voussoirs.blogspot.com.au/2013/12/gold-coast-guggenheim-gangnam-wow.html Now private developers appear to be wanting to outdo everyone. The report was unequivocal: ‘Two sculptural residential towers and a world-class private cultural precinct to rival the Guggenheim Museum at Bilbao in Spain are about to rise above Mariner’s Cove in The Spit.’ It seems to be a certainty. While the headlines boasted that the whole of this ‘$600m towers and world-class museum’ project was designed by Zaha Hadid, the text was less certain, noting that: ‘The stunning two-tower project has been designed in collaboration with internationally acclaimed Iraqi-British architect Dame Zaha Hadid — the first woman to receive the prestigious Pritzker Architecture Prize.’ There is an odd variation here. While ‘collaboration’ waters down the authority of the headline, the superlatives are now wrapped around the Zaha name in order, it seems, to overcome this weakness, to counter it. There is nothing that gives any hint as to who might be ‘collaborating’ with Ms Hadid. Still, the ambitions are there: the 44 storey apartment/hotel project will be ‘the city’s first privately owned cultural precinct dedicated to the arts, with a gallery, museum and outdoor sculptural gardens.’ It is hard to see a commercial high-rise apartment/hotel scheme being singularly ‘dedicated’ in this way. One is left wondering just what part of this scheme might become the new ‘Bilbao.’ Is it the different, quirky, ‘organic’ shaping of the towers that is seen as the eye-catching attraction, or is it the substance of the collection on display? The towers are perhaps more an enigmatic commercial identity, maybe a branding, rather than a singular bright light to an international moth, so might it be the contents of the gallery and museum that are to appeal, to become the drawcard? There is no indication just what these pieces might be. What collection is this? Whose is it? Has it yet to be assembled? By whom? Might it be the Louvre; the National Gallery? It is just described as a sundry set of things ‘cultural,’ ‘art’ – ‘with a gallery, museum and outdoor sculptural gardens.’ As if this catchall of art gallery and museum might not be enough, the text elaborates: The project ‘also will feature an underground aquarium and 1950sq m of ground-floor retail and dining space.’ These features are presented as if they might be add-ons to the building itself that is seen as ‘a work of art on an architectural scale’ – ‘a trophy’: ‘monumental architecture.’ Why might such a masterpiece need more? Has the Gehry building this combination of accessories? Does it need them? The pyramids stand alone as ‘monumental’ icons without any supporting interests. What is this ‘vibrant mixed-use setting’? Is it? Will it be? How? Why is Mariner's Cove ‘an exceptional site worthy of monumental architecture,’ as Abedian says? Words are just not enough. Consider: ‘ "Each residential tower is designed as if it were an organic, living form, with sinuous lines interlacing upwards from the tapered base, creating a sense of flow and movement," he (Abedian) says.’ What is the value and relevance of this – well, this seemingly apparent ‘vibrancy’? "This vibrancy is further brought to life by the reflection and interaction of the glass facade with its stunning Broadwater setting." 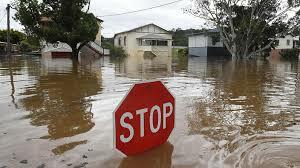 Gosh, will the reflections become the problem that other projects have experienced? What might the ‘interactions’ be? Is this really something to be desired? 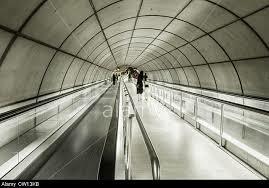 Will each apartment/hotel room remain private or be on grand display for all to peruse, for ‘interaction’? There is an apparent attempt to promote this project as an integrated whole. 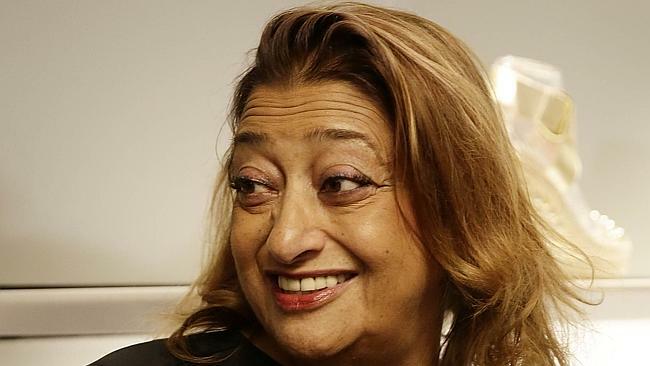 One wonders if Hadid had any say in these descriptions: ‘At the ground plane, the towers merge seamlessly with public spaces dedicated to culture and the arts via an art gallery and museum, an outdoor sculptural art precinct, and conference centre.’ Now there is a conference centre too! What happens to the cars, the ‘ground plane’ access and parking for the 370 apartments, 69 boutique suites, art gallery, museum, restaurants, shops, conference centre and aquarium? "The entire ground level has been designed as a continuous public amenity, with a plaza and waterfront promenade connecting retail and dining spaces, boardwalk gardens and pedestrian links.’ So it is really a people-place complete with the newly revealed ‘boardwalk gardens and pedestrian links’ – to where; from where? "The underground aquarium, organically integrated in the landscape and plaza layout, completes the master plan." What does this mean? Might the project be incomplete without the aquarium? How it is ‘integrated’ into the ‘pedestrian links,’ the ‘plaza,’ the ‘promenade,’ the ‘boardwalk gardens,’ and the remainder of the development? Dare one ask about the car park for hundreds of cars? Given more thought, these statements are all words that really say very little that is specific about the scheme. They appear to be broad and hopeful, inspired by the illustration, the ‘artist’s impression,’ that exuberantly tells about what is shown as it cleverly conceals much with its distracting attractions. 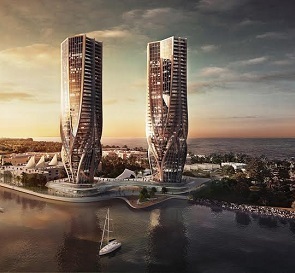 The statements appear to seek to subtly explain contentious matters: ‘Abedian says increasing the height of the project allows for a smaller development footprint to create "generous view lines and pedestrian access to the waterfront".’ The message here suggests that the whole idea of the project has been to create a place for people, with towers reducing in size to open up vistas and access, creating a reduced footprint that demands the height – all, apparently, for the ordinary person to enjoy. In short, it seems to be the declared ambition to cater for the common man, (perhaps not too common), that has pushed the project up to the extreme of 44 stories. ‘Sunland's plans for Mariner's Cove have been in development for some time. The company is understood to have originally proposed a larger-scale development that would have required the acquisition of vacant state government land adjacent to Mariner's Cove.’ Realistically, this option seems to have struck a political problem with the change in government. There are many mixed messages here. They appear similar to those used to promote the Grace on Coronation project – an urban village - that is another Zaha Abedian Sunland set of towers described alluringly as ‘champagne flutes’: a ‘champagne project’? 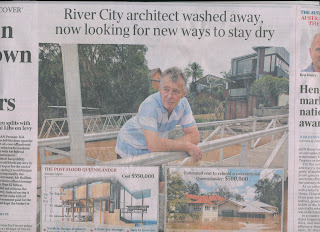 – see http://voussoirs.blogspot.com.au/2014/09/ha-ha-ha-hadid-designs-for-world-class.html One does wonder if this Gold Coast project might not be the same or a very similar design adapted in ‘collaboration’ with the Toowong scheme. Nothing is made clear to describe just what is going on. Reading the two reports – see below – one does discover the similarity in the texts suggesting that both have used media kits for sources. The big difference between the Grace and Mariner’s development is that the promo for Grace had words directly attributed to Hadid. Mariner’s does not. What has Hadid done here? Who is working with her? 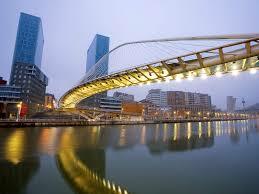 Is this Gold Coast ‘Bilbao’ proposal merely an adaptation of another scheme that might not go ahead as planned? Indeed, the proposition might be: why waste an idea? The hopes for another ‘Bilbao’ success story linger, but can they be achieved here? 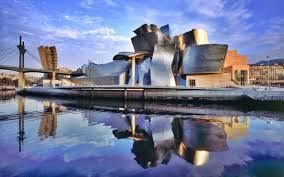 Does Bilbao do more than push for a major commercial apartment block and a twinned smart hotel - should they match? 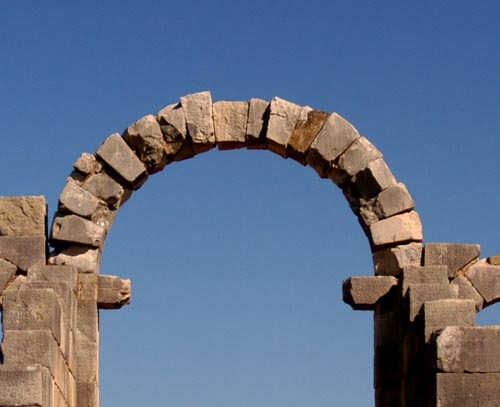 - with a supporting base of a few incidental cultural features, whatever these might be? 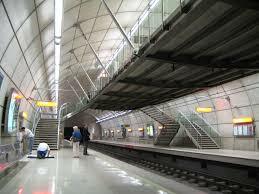 Bilbao seems to have a more holistic vision, richer and with a greater civic commitment. It did get a Gehry gallery, but it also revitalised the city with a marvellous bridge and a Metro that infiltrate and connect place with excitement, vigour and a new vision - a new, vital optimism. 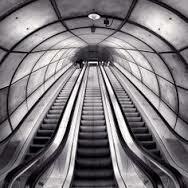 The difference appears to be in things urban, in their communal intent and experience. 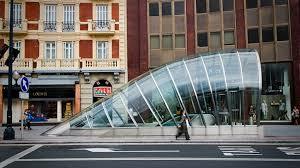 We will have to wait to see if commercial towers on top of a gallery-museum-aquarium-conference centre plaza can dramatically and significantly change place in the way Bilbao has been transformed. We must be careful of words and analogies that appear useful as preliminary promotional tools. We need to seek out the reality of the whole before it is eulogized. Dreams can very easily turn into nightmares. Sunland unveils proposal for $600M residential and cultural precinct at Mariner’s Cove. TWO sculptural residential towers and a world-class private cultural precinct to rival the Guggenheim Museum at Bilbao in Spain are about to rise above Mariner’s Cove in The Spit. The developer behind the Q1 supertower and Palazzo Versace Hotel has unveiled its long-awaited plans for the $600 million landmark. Sunland Group has lodged a development application with Gold Coast City Council for the redevelopment of Mariner’s Cove. The stunning two-tower project has been designed in collaboration with internationally acclaimed Iraqi-British architect Dame Zaha Hadid — the first woman to receive the prestigious Pritzker Architecture Prize. 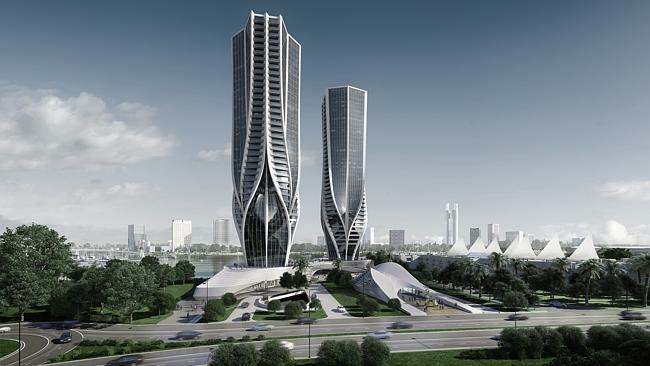 Sunland’s proposal comprises two sculptural residential towers of 44 storeys — one featuring 370 apartments and the other a 69-suite boutique hotel. The groundbreaking project will include the city’s first privately owned cultural precinct dedicated to the arts, with a gallery, museum and outdoor sculptural gardens. 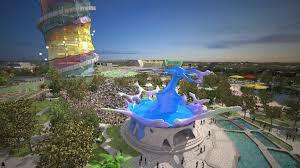 It also will feature an underground aquarium and 1950sq m of ground-floor retail and dining space. Dame Zaha Hadid has designed the proposed Sunland towers and cultural space. Sunland Group purchased the trophy site adjacent to Marina Mirage on Sea World Drive overlooking the Broadwater in 2013 for $13 million. Mariner’s Cove is Sunland’s second collaboration with Zaha Hadid, the architect behind the group’s proposed three-tower $420 million residential Grace on Coronation project. 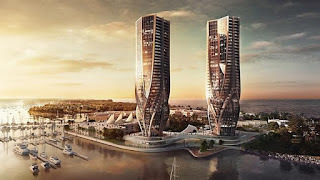 It features a quilted diamond facade, planned for the old ABC site on the Brisbane riverfront in Toowong. Sunland executive chairman Dr Soheil Abedian, who has long advocated for the city’s cultural enhancement, said the proposal combined leading architecture and residential spaces with unique, world class tourism and cultural amenity. Sunland managing director Sabha Abedian said the design was a work of art on an architectural scale. “This development will be one of the greatest architectural undertakings in Sunland’s history and a landmark destination,” he said. SUNLAND Group has taken a giant leap back into the Gold Coast high rise market with plans for a $600 million redevelopment of Mariner's Cove. 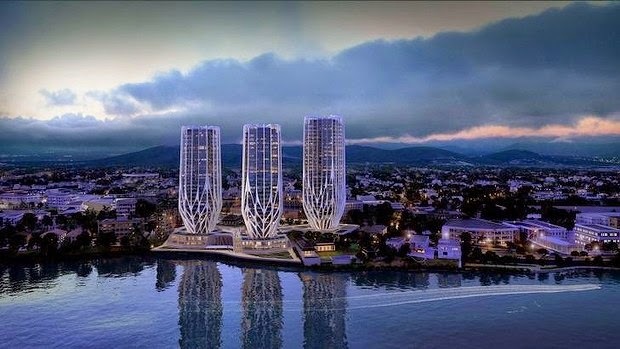 The proposal, which features two sculptured towers of 44 storey each, is likely to spark spirited debate over high rise development on The Spit. 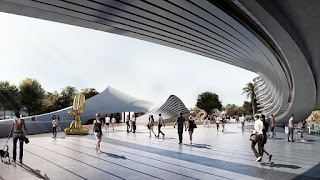 However, Sunland executive chairman Soheil Abedian has described the project as a world-class landmark development that will deliver a new cultural precinct for the city in a vibrant mixed-use setting. "Mariner's Cove is an exceptional site worthy of monumental architecture," Abedian says. "This proposal has the capacity to enable the Gold Coast to further define its cultural identity, not only through defining architecture, but also through the enhancement of the cultural aspects it will provide to the city." Sunland has lodged a development application with the city council in a bid to transform the ageing Mariner's Cove site into a precinct that combines luxury living with the arts through a dedicated art gallery, museum and outdoor sculptural gardens. It will be the Gold Coast's first privately-owned cultural precinct and will also feature an underground aquarium, as well as 1950sqm of ground-floor retail and dining space. The twin-tower design, created in collaboration with Pritzker Prize winning architect Dame Zaha Hadid, will comprise 370 apartments and a boutique hotel of 69 suites. 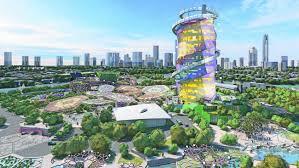 The design has a similar theme to Sunland's proposed three-tower redevelopment of the ABC studios along Brisbane's riverside in Toowong. 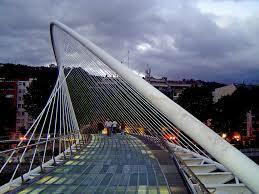 That also was designed by Hadid. Abedian describes the company's latest Gold Coast vision as "a work of art on an architectural scale" and "one of the greatest architectural undertakings in Sunland's 32-year history." He says it will be a "landmark destination of international significance and acclaim". "Each residential tower is designed as if it were an organic, living form, with sinuous lines interlacing upwards from the tapered base, creating a sense of flow and movement," he says. "This vibrancy is further brought to life by the reflection and interaction of the glass facade with its stunning Broadwater setting. "At the ground plane, the towers merge seamlessly with public spaces dedicated to culture and the arts via an art gallery and museum, an outdoor sculptural art precinct, and conference centre. Abedian says increasing the height of the project allows for a smaller development footprint to create "generous view lines and pedestrian access to the waterfront". Sunland's plans for Mariner's Cove have been in development for some time. The company is understood to have originally proposed a larger-scale development that would have required the acquisition of vacant state government land adjacent to Mariner's Cove. The company acquired Mariner's Cove from receivers for $13 million in 2011 and has indicated for a long time its intention to create a landmark development on the site. The Mariner's Cove project is part of a $1.5 billion-plus development surge for the company on the Gold Coast. This week, Sunland announced the settlement of a $61 million deal to acquire the 41.9ha Lakeview site at Mermaid Waters, where it plans to build 1425 dwellings, including residential housing, townhouses and medium-rise buildings. The Gold Coast still accounts for a significant portion of the now Brisbane-based Sunland's $4.3 billion national development portfolio.